Internet today has become mainstream, earlier it was a privilege and was used only by government, big business houses and to connect laboratories engaged in government research. But with time Internet and its usage have changed drastically. It has expanded since 1994 and is now utmost part of everyone’s life. Internet is a universal source of information, a powerful platform used by all age groups geographically. Two things that played a major role in making it popular are mobile technology and social media. Mobile technology on one hand with use of Internet has made it possible to connect with people across the globe. Social media on the other hand has introduced a new way of communication via Facebook. Twitter and other social networking sites. If today, you ask any teenager what was life like pre-Google they consider you insane. For millennials there is no world without connectivity and mobile devices. Internet has turned our existence upside down, it is used in everything we do whether it be ordering a food, booking travel or movie tickets, taking doctor’s appointment, ordering medicines or grocery items all is done via Internet. But there was life prior to Internet and it was much different. 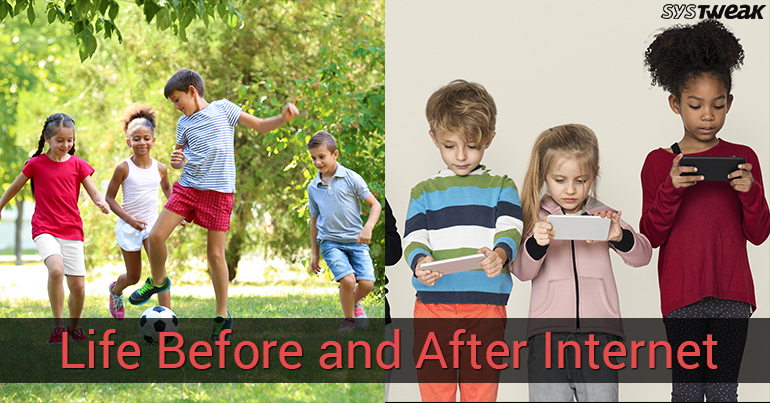 Today, in this article we will try to show how life turned after Internet and what it used to before Internet. Memories fade away with time and same is the case with physical books, encyclopedias. Teenagers and kids no longer like to use physical books. They consider them bulky and cumbersome but that was not the case earlier, physical books were the only source of gaining information. But now with e-books it is easier to gain more information and knowledge. It has eradicated the trouble of visiting a bookstore, or to wait for an expert to explain the topic to everyone. Google is the best teacher as it has answer for all the questions. Today the concept of library is kind of lost as all of us use Google to get information about everything. But earlier things were different researchers use to spend time lot of time in library to read and refer books for better understanding of the subject material. They used to take down notes on paper which was hard to store as there was lot of wear and tear. But Internet has made all things easy now you can clip important text to the clipboard, highlight it, can make as many notes you want without thinking of how to store them. Like it or not, due to Internet, personal or face to face communication has come to an end. Our minds have started to work differently, we prefer sending emails, messages online rather than meeting in person. To know about a person, we check their Facebook status or Twitter account rather than contacting them in person. Nowadays people consider it time wastage when they are asked to meet someone in person instead they would prefer video chat, teleconferencing and other online mode of communication. Internet has made worldwide communication easy, you can now inform in time other party if you are late for meeting or want to reschedule it. Plus, getting information about your loved one sitting at another corner of the world is much easier. No longer do you need to stand in pay phone queues, or to book a trunk call to hear voice of your loved one. In 90’s word processors and printers were there but they weren’t popular due to which people faced problem. Internet has resolved all these problems. Success of online shopping portals Amazon, eBay clearly states no longer there is a need to visit a store. You can now order everything from anywhere even while relaxing you can shop for your favorite dress or grocery. No more standing in billing lines or doing window shopping. You can simple visit the online sites look for the best price and order things that will be delivered to your doorstep. Why to carry those shopping bags when someone can deliver to you. Not so long ago the concept of travel was to discover something. Today, you can know everything about a place before you reach there. You don’t have to wait for a bystander to give direction or guide you to your destination. There are number of apps and GPS that will do that all for you and will guide you in the right direction. You can now compare prices and book a cab, flight tickets, bus or train tickets easily without standing in lines. No need of paper maps or to wait for a taxi to reach a destination. Now all this is a tap away. Remember the days when you had to burn custom music CD’s or borrow them from friends. That was all in past. With Internet you have everything that you want at one place. No need to wait for friends to play games, as online games are an alternate for it. No need to wait for TV shows to be on air as you have them online. No need to visit cinema to watch latest movies. Now, what you need to wait is for next season of the show rather than the episode. Once upon a time to pay bills, transfer money and do basic financial operation you had to stand in lines. But with the emergence of online banking things have changes. Now you can transfer money to anyone anywhere, can pay bills online even can order food and pay online. Using mobile wallets, one touch payments are now most common people are slowly forgetting the concept of dealing in cash and cheque. What they know is plastic money. To know someone you don’t have to meet him in person. Now you can make friends online, meet love of your life by simply using a app. Be it knowing about your loved ones or letting them know about you all can be done via a app. Now people don’t rely on individual they rely on the circle of trust or followers, comments left on their profile. Internet has made everyone their own doctor. Just enter the symptoms you are facing and know the sickness even more prescribe medicine for yourself. Technology has advanced but not to this extent that you can rely on any and everything that you read online. Especially when it comes to your health you shouldn’t. Knowing things, gaining knowledge is good but relying on them blindly without consulting an actual doctor is not good. Knowledge will help you from being fooled but won’t treat you like a physician can. The way we communicate has a great impact on market. Internet is changing marketing techniques. No more people like to buy things from a store they look for best discounts on brands rather than going for sales in store. Companies are attracting users via content and by offering them delightful and personalized experience. To be productive is it necessary to spend eight hours in office? Earlier this question made no sense as the answer was of course. But today things are different Internet has changed them with web based tools and constant connectivity employers, employees both private and government can stay in touch. Now you can work from anywhere rather than sticking to the seat a cubicle accesses your work documents from anywhere and be productive and more creative. There weren’t ways to make secure payment earlier as at the cash counter the cashier use to make a carbon copy of the card until then it wouldn’t be charged. But now hackers steal your information without you even knowing it. Without you even swiping the card they will have all your information and will use it for their own personal gain. These examples clearly show that Internet has waxed and waned in both directions over time. Presently, technology is overtaking our wisdom, if we don’t take the responsibility then soon conditions may go from better to worse. Internet has given us a lot but has even taken many good things away from us. People don’t communicate the way they use to do face-to-face interaction this is hampering relationships. Older people will surely have a Nostalgia but this doesn’t mean we stay in that era. It’s always great to move forward but it doesn’t mean we need to leave the good things behind. Internet is overloaded with content it is up to us to decide what we want and how to limit the usage of digital device and enjoy life. For those who don’t have memories of life before the Internet, you can try using Social Fever an app that will help you stay away from digital distraction. Try remembering your interest, enjoy quality time with your family. Give some time to your loved ones it is worth it.